Folk City curator Stephen Petrus, Andrew W. Mellon Postdoctoral fellow at the City Museum from 2012–2015, talks about his Hungarian roots, growing up with Dylan, and the mythology of the Newport Folk Festival in ‘65. The exhibition has been extended through January 10, and his critically acclaimed book Folk City: New York and the American Folk Revival is available at our Shop. This interview has been edited and condensed. How did you get interested in the topic for the exhibition? I’ve always been interested in post-WWII New York, what happened in the 50s and 60s, and I’m also fascinated by cultural movements that challenge the status quo. So that took me to Greenwich Village, where the arts flourished, where fresh ideas were debated. Folk music was part of that dynamic mix. Also, there were new trends in theater and film and in dance. The Village really nurtured these experimental movements. When did you fall in love with the music? That goes back to my childhood, growing up with older brothers, and listening to rock and roll and to folk music, to David Bowie and the Stones, and Dylan too. Dylan from early on really fascinated me, and he was my entrée into the folk music world in the 60s. It expanded once I came to realize that he wasn’t just a solitary genius but he was connected to so many other figures in the Village at the time, people like Dave Van Ronk, Ramblin’ Jack Elliott, Joan Baez. The music opened doors for me. This music was before your time though. If you’d been around in those days, what concert would you have most wanted to see? Dylan’s performance at the Newport Folk Festival in 1965, when he ‘went electric.’ It caused a firestorm. Some people booed, many people cheered, but it represented a turning point in folk music. It would have been amazing to be in the crowd that night, to get a sense of this. It wasn’t simply somebody playing electric guitar at a folk festival, but it represented his turning away from the folk movement. Doing the research for this exhibition, I met several people who were there. Betsy Siggins, a founder of Club 47 in Cambridge, said that she was backstage and that Dylan was so distraught afterwards that he just sat on her lap and was speechless. Although some people say that she wasn’t backstage. But that’s what’s interesting too—the moments become mythologized. Like, were you really there? It’s become larger than life. And Dylan’s lyrics are on display in Folk City. Yes and the songs themselves—to me—transcend music. They are commentaries about the period itself and about one artist’s evolution. Dylan hated the label “protest singer,” but “Blowin’ in the Wind” and “Masters of War” captured the zeitgeist. 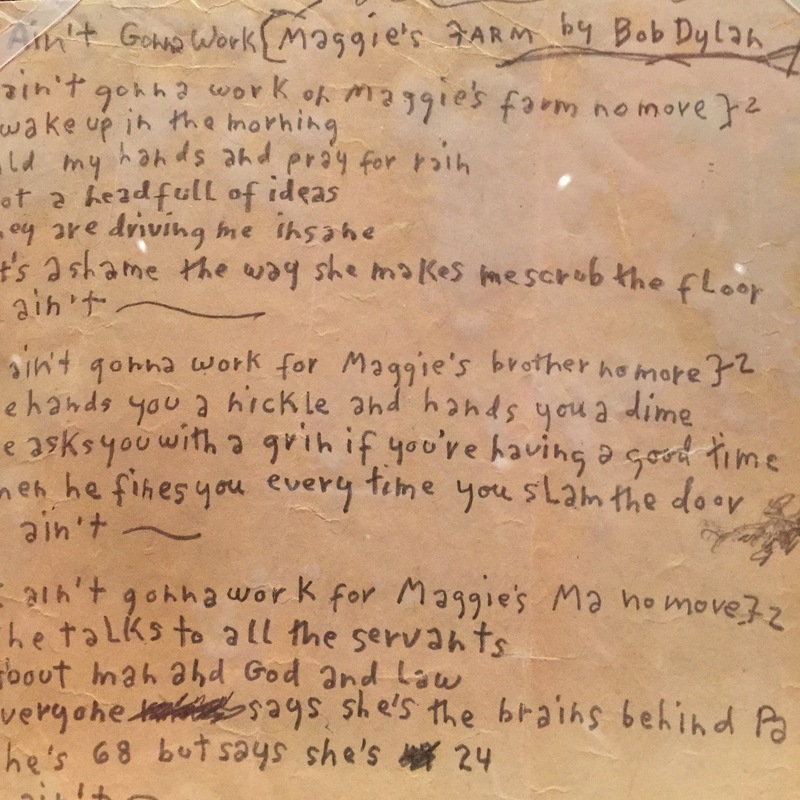 The lyrics from “Maggie’s Farm,” the first song he sang at Newport in ‘65 on electric guitar—‘I ain’t gonna work on Maggie’s Farm no more’—basically translates into I’m not your spokesman of a generation, I’m not your protest singer. So he’s moving on from “Blowin’ in the Wind” and “Masters of War” and proclaiming his independence from that part of the movement. What do you want people to take away from the exhibition? One of the goals is to leave you thinking about the power of song in American society. Can they help fuel movements and change society? 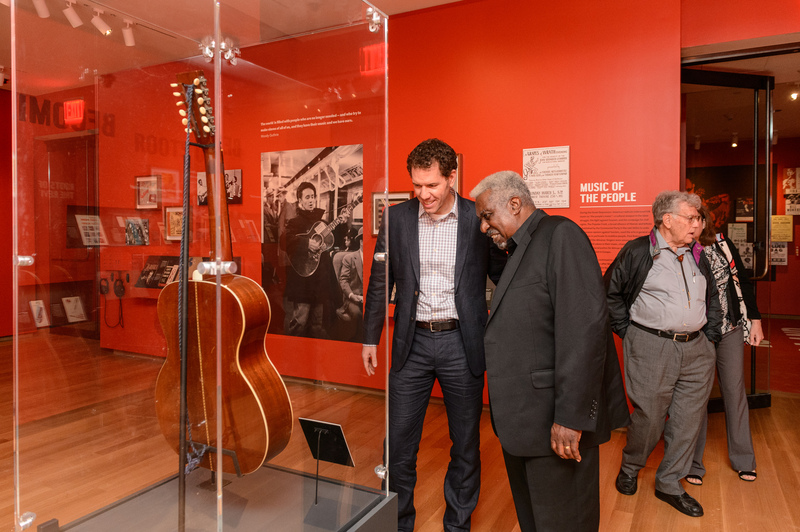 And the other point is that the folk music revival encouraged people to look back at their cultural heritage and to recognize that folk songs are part of American culture, and reflect our multiracial, multicultural identity. They come from different regions of the country, Appalachia, the Mississippi Delta, the Western Plains, New England. And they provide us a window into who we are and what our concerns were, what our hopes were, what our struggles were. I’m Hungarian by background and my dad plays the violin, he plays traditional folk songs. To this day, often in the summertime, my parents go to see friends, other Hungarians who came to the country in 1956 after the Revolution and they’ll sit on the back porch and eat and drink and sing songs. Traditional songs about love and joining the army and working, labor songs. They’re fun, they’re serious, they’re humorous, they’re across the spectrum. These songs are part of everybody’s identity in some way. And maybe if you’re not cognizant of that, maybe this exhibition and the accompanying book will get you thinking about where you come from, where you were born, where your parents and grandparents and great-grandparents came from, what their folkways were. And not just the music, but their dance, their dress, their cooking, their festivals, their religion, their language. Music is just one of our customs. Jenny Shalant is the Director of Digital Marketing at the City Museum. I was sorry to have missed this exhibit in 2015. 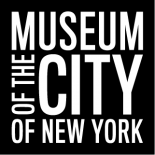 Are there any plans for it to return to MCNY in the future? This entry was posted on August 23, 2015 by Jenny Shalant in Exhibitions.